For the second consecutive year, Monfils advanced to the final at Bercy and came up short. Still, Monfils along with compatriot Michael Llodra made history at the event. Llodra ousted defending champion Novak Djokovic in the third round then upended Nikolay Davydenko in the quarterfinals. In so doing, two Frenchmen were in the semifinals for the maiden time in the tournament’s history. Moreover, Llodra was one forehand winner away from upsetting Soderling and making it an all French final. For Soderling this is his sixth career title and the fifth indoors. In claiming his first masters shield, Soderling leaps over Murray and takes the number four spot, the Swede’s highest career ranking. 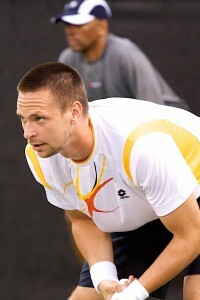 Last year, in his debut at the ATP World Tour Finals, Soderling fell in the semifinals. Undoubtedly, this victory magnifies the Swede’s confidence which means he will once again be a great peril to his rivals in London.